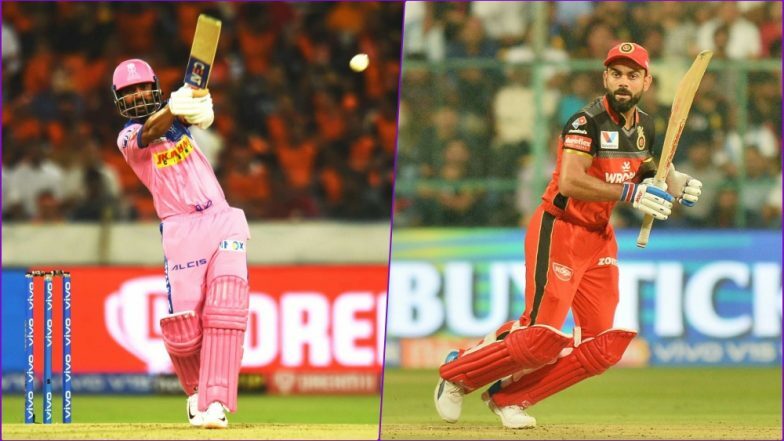 RR vs RCB Head-to-Head Record: Ahead of IPL 2019 Clash, Here Are Match Results of Last 5 Rajasthan Royals vs Royal Challengers Bangalore Encounters! It is a battle of the Royals in VIVO Indian Premier League (IPL) 2019 Match 14 in Jaipur as Rajasthan Royals (RR) and Royal Challengers Bangalore (RCB) look to break their duck. The hosts led by Ajinkya Rahane have looked settled in terms of their playing eleven, but failure in grabbing hold of crucial stages of the game have cost them big. On the other hand, bottom-placed Virat Kohli-led Royal Challengers Bangalore are clueless in terms of their strategy and are reaching the stage where someone would be held accountable, and heads could roll. In terms of RR vs RCB head to head record, the two teams have met 19 times with Rajasthan Royals having the edge winning 9 games to Bangalore’s 8. One of the games had to be abandoned while the other produced no result. Here is how their last five meeting between RCB and RR panned out. Rajasthan Royals vs Royal Challengers Bangalore Live Cricket Score 14th T20 Match. Rahul Tripathi hit a blazing 80 off 58 balls to steer his side to 164-5 batting first with the help of a little cameo from South African keeper Heinrich Klassen. In reply, RCB were bundled out for 134 under 20 overs with AB De Villiers’ 53 the only shining light. Shreyas Gopal was the destruction in chief for Rajasthan picking up four wickets. IPL 2019 Video Diaries: Prashant Chopra Has a Message for Skipper Ajinkya Rahane Ahead of RR vs RCB Match in the Indian Premier League 12. A high scoring game with the bowlers in the firing line throughout the completion of the two innings. Rajasthan buoyed by Sanju Samson’s 92 posted 217/4 on a batting-friendly pitch in Bangalore hitting ten massive sixes in his innings. The Bangalore chase was led by skipper Virat Kohli who hit a half-century and Mandeep Singh’s power hitting in the tail end. RCB lost by 19 runs, but the game was close for long periods. Man of the match AB De Villiers put in an exhibition of trademark T20 shots for the Pune crowd to feast upon and young Indian batsman Mandeep Singh on the other end provided good support helping RCB set a target of 181. The RCB bowling unit were disciplined and barring Mitchell Starc all picked up a brace each helping the team register a 71-run win in the 2015 IPL Eliminator. The rain gods denied the Royal Challengers Bangalore a win as their 200 runs on board in the first innings proved to be of little consequence. AB De Villiers made 57, and Sarfaraz Khan smashed a 21 ball 45 in the death overs to put RCB in command. But the second innings never saw the light of the day as heavy rains played spoilsport. Australian pacer Mitchell Starc picked up three wickets to restrict Rajasthan Royals to 130/9 on a slow, damp track of Motera. Yuzvendra Chahal and Harshad Patel picked up a brace each to cap an excellent performance by the visitors bowling unit. Virat Kohli and AB De Villiers remained no out to chase down an easy target for RCB. Rajasthan won their two games against Bangalore last season, and they will be eager to continue this winning streak against them this evening with both team’s title hopes hanging by a thread.